If there’s any content marketing prodigy that you should pay particular attention to, it’s Netflix. Very few companies have led the spawn of an entire industry, and still managed to stay ahead of the curve. The streaming video service closed 2016 with 93.8 million subscribers, up nearly 20 million from the year prior. Its strategy is very tactical, and it plans to keep it that way. Have you ever heard the company publicly speak to its methods of exposure? Netflix is extremely covert in the area of marketing; you’d almost think it's Magic Leap. Even if you’re not in the media business, there’s a lot to learn about how Netflix approaches content and goes about amassing an audience. It is an excellent example of content marketing leveraging its product, data and social media. Here are four takeaways every content marketer can learn from Netflix. Build the experience through standalone products. Seemingly, Netflix doesn't place the most value in traditional marketing. Its approach is much more innovative, even to the extent of creating standalone products to extend the experience of a new show. In the era of 360 video and artificial intelligence, no idea is too large. Netflix is not afraid of walking this line and more often than not, it provides a tremendous return on investment. For example, Netflix recently commissioned the third season of the highly touted Black Mirror, which explores the scary possibilities of technology. To promote the show, Netflix actually created the app Rateme that was the conflict and downfall of the first episode of the season. It did something similar with a Stranger Things web tool, which allows users to create content with the show’s font. Also on the list are Netflix socks, among other consumer products that make light of the culture of its dedicated audience. Content is not distinct to the confines of an article or a video. Many times, content marketing is a product or a standalone experience that gets the conversation going and creates the opportunity for the audience to get involved in the show's universe. Netflix invests in original content so much that it can almost market itself. Entrepreneurs and marketers specifically should learn to invest effort and finances into the kinds of content that have proven successful with their audience. In the last three months of 2016, Netflix added 1.43 million new U.S. paying subscribers. In 2017, Netflix plans to spend nearly $6 billion on content. For context, ESPN spent $ 7.6 billion on content in 2016. Such an investment may be necessary for the growing competition of streaming video services, but solidifying a budget to create quality content is not a strategy that is unique to just media companies. Data is certainly the differentiator. We all know data matters, but are you sure you're leveraging the right metrics? Netflix uses data to predict behavior and to help create a better experience, ultimately inspiring a lot of its marketing. Inside the product, Netflix tracks your browsing behavior; what time you watch content; when you pause, rewind or fast forward; and what kind of content is viewed on which day. Using this data to understand consumer behavior, it can both suggest the right content in the product that makes you stick around longer, as well as adjust its marketing content to fit your interests. Netflix used big data to promote House of Cards. User behavior was very much the deciding factor on its series rollout of marketing collateral. Before a series is released, there’s typically one or two trailers made to build the buzz. For House of Cards, Netflix made 10 different cuts of the trailer and served you a trailer based on your previous viewing behavior. If you watched a lot of Kevin Spacey, you saw the trailer that included more of his scenes. If you happened to actively rate and suggest David Fincher's work as a director, you were shown a different trailer. Through Netflix's algorithms, it can determine who might be interested in new shows and can cater content that will be best received, according to its data. How are you using data to steer your marketing content for better engagement? Netflix's success in original programming is not by accident; its data having a large influence on its content marketing is a technique we should all mimic. There’s so much talk about "going viral," but do we ever explore the science behind it? Netflix has a knack for catching virality, and it stems from making content easily shareable and having a consistent and honest brand voice. Netflix is known to provide content that pairs well with social media, helping insert itself into everyday conversations. Above is a landing page where Netflix hosts a Rolodex of funny gifs featuring your favorite Netflix series, allowing you to share on Facebook, Twitter or even download for your use. The takeaway is you need to encourage virality. Help your content get to the tweetosphere and allow it to literally be a part of the conversations your audience is having. Their brand voice has also added to Netflix's visibility across the internet. It's mastered the tone of voice and it's done numbers on social. 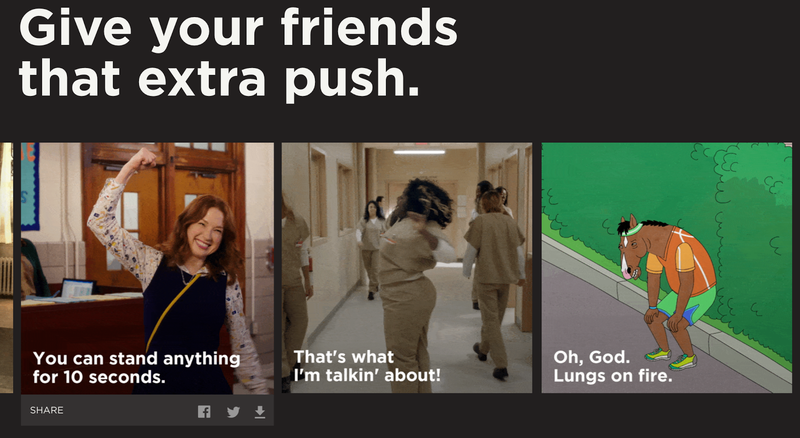 With such an authentic and conversational voice, Netflix established a tone that creates a loyal fan base that will actively engage with their content. Its best performing content just involves a bit of its swag rather than a big announcement. It should compel marketers to plan for content that gets people excited enough to head to your owned channels. Netflix is a dominating force, and much of its success is attributed to its approach to content marketing. Its unconventional methods are the forward-thinking techniques we should all adopt to build a dedicated audience.